The quake struck around 220 miles off the coast of Sumatra, the province most devastated by the 2004 tsunami. The green arrow here indicates the epicentre of the 7.3-magnitude earthquake which struck at 6:37pm Irish time. A TSUNAMI WARNING was briefly issued in Indonesia after a powerful earthquake struck around 220 miles off the country’s coast. The quake, estimated by the US Geological Survey to be of magnitude 7.3, struck 262 miles south-west of the city of Banda Aceh, which was devastated by the Christmas tsunami of 2004. The quake had an estimated depth of 18 miles beneath the surface of the earth – and prompted national geological authorities to issue a tsunami alert for fear of a repeat of the 2004 tsunami which was prompted by quakes measuring up to 9.3 in magnitude. AP said that officials in coastal cities had not reported any serious injuries or damage, and that authorities had lifted their tsunami warning around two hours after the quake hit, which was at 6:37pm Irish time. People in Banda Aceh – which remains deeply traumatised by the 2004 tsunami – were rattled from their sleep by the quake. They fled their homes and waited outside as sirens blared from local mosques, some hopping in cars and motorcycles and heading for high ground. Indonesia is prone to seismic upheaval due to its location on the Pacific ‘Ring of Fire’, an arc of volcanos and fault lines encircling the Pacific Basin. Email “Indonesia on brief tsunami alert after 7.3-mag offshore earthquake ”. 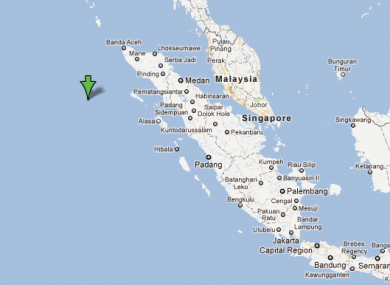 Feedback on “Indonesia on brief tsunami alert after 7.3-mag offshore earthquake ”.